This is used as the color of the brush used when drawing a BarSeries. 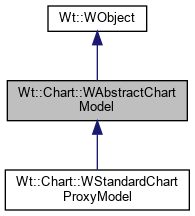 The default is null, indicating that the default color, as determined by WDataSeries::brush(), should be used. This is used as the color of the outline of bars when drawing a BarSeries. The default is null, indicating that the default color, as determined by WDataSeries::pen(), should be used. This is used as the color of the brush used when drawing a PointSeries. The default is null, indicating that the default color, as determined by WDataSeries::markerBrush(), should be used. This is used as the color of the outline of markers when drawing a PointSeries. The default is null, indicating that the default color, as determined by WDataSeries::markerPen(), should be used. This is used to scale the size of the marker when drawing a PointSeries. The default is null, indicating that the default scale should be used.